Our family loves to eat. If you read about our very own kid-approved food tour of New York City, you know that we don’t have to be in fancy restaurants to enjoy our food. With all of our travels, we felt like we had been neglecting our hometown. 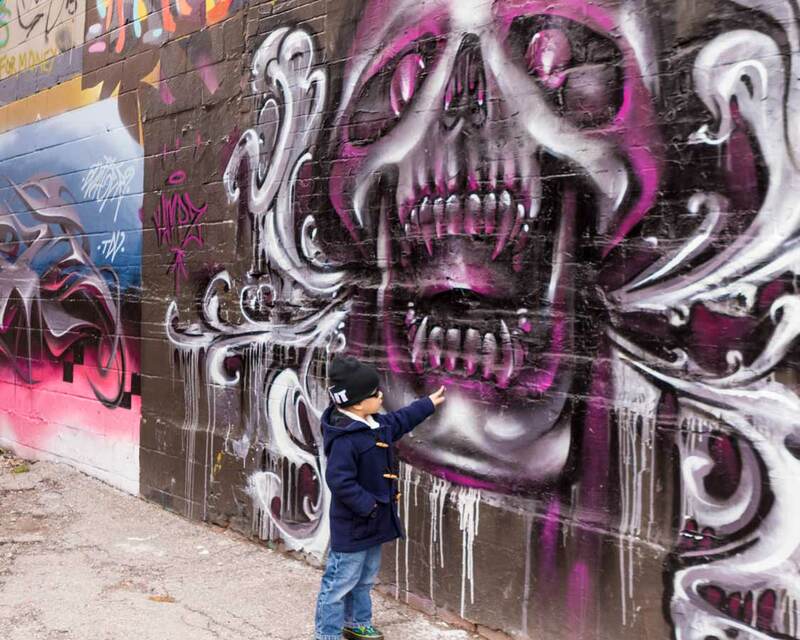 So, we’ve been checking out cool things to do in Toronto with kids. And when we were given the opportunity to join a local company, Tasty Tours, on their Toronto food tour we jumped at the chance to get a taste of Toronto delicacies! Tasty Tours Toronto is a local food tour company that provides intimate city tours that focus on some of Toronto’s hottest neighbourhoods. Beyond just the amazing food, they also combine it with Toronto sightseeing experiences. They share behind the scenes facts and information to help locals and visitors alike gain a greater understanding of Toronto. Tasty Tours offers two different types of food tours in Toronto. The first is Toronto’s Ultimate Chocolate Tour. This tour is definitely for those with a sweet tooth. 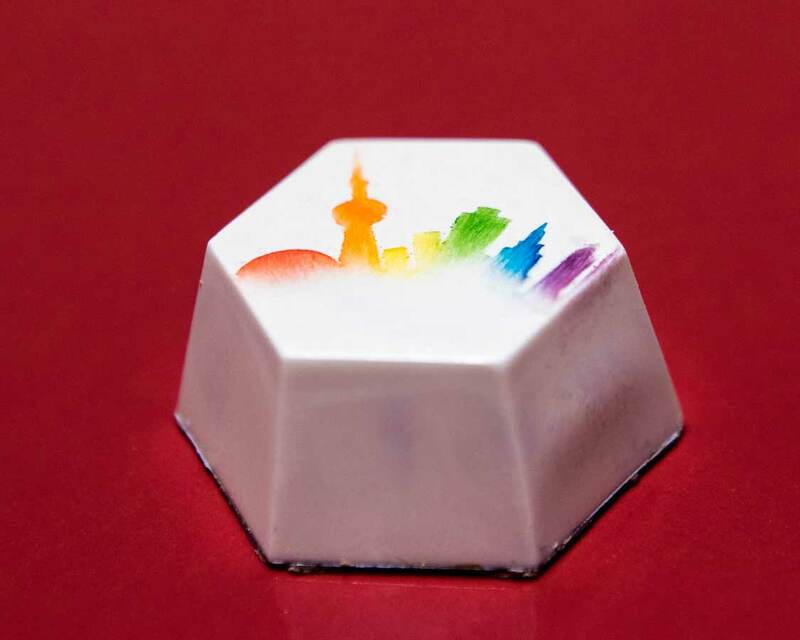 Besides tasting all things chocolate found in the Toronto neighbourhoods of King West, Queen West, and Dundas West, also included in the tour is a demonstration of how the local chocolates are made. We were intrigued by that tour, especially since our experience learning to make chocolate in Cusco, Peru. Additionally, this chocolate tour visits SOMA chocolate, a chocolatier right in downtown Toronto. 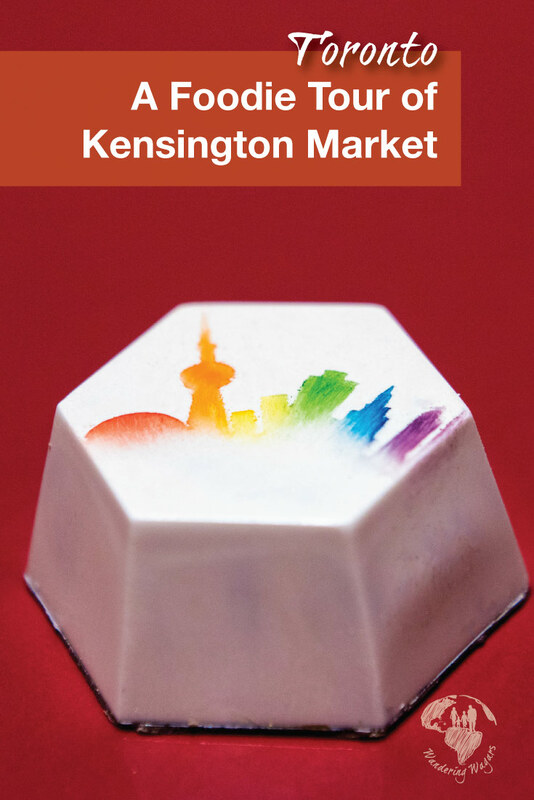 The second tour is the Kensington Market Sweet and Savoury Food Tour. As the name suggests, the tour involves tasting a variety of sweet and savoury foods from the Kensington Market area of Toronto. It was a tough choice but we opted for the Sweet and Savoury Food Tour so off we went on our culinary tour of Kensington Market. Kensington Market is a hip, anti-corporate neighbourhood west of Spadina Ave between College St. and Dundas St W. The area is definitely one of our favourite Toronto neighborhoods. Kensington Market is a very diverse community. It is full of locally owned shops, restaurants, and art studios. It has become incredibly popular lately as a destination to find some of the best food in Toronto. 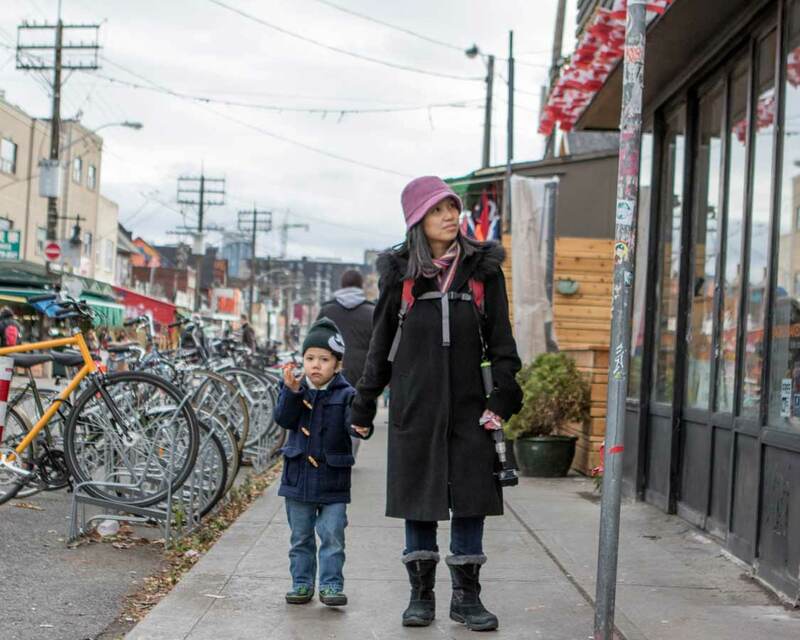 Because Kensington Market is in the heart of Toronto, just west of downtown, Toronto tourist attractions can easily be accessed by public transit. From the Toronto subway, you can either get off at College subway station and take a streetcar south to Dundas St. Or get off at Dundas station and take the Dundas streetcar west to Spadina Ave. To help plan your travels, you can visit the Toronto Transit Commission for more information on subway and streetcar schedules. A visit to this hip neighbourhood is super fun if you want to discover what to do with kids in Toronto and are tired of the ordinary attractions. When you sign up for your Tasty Tour Toronto food and local sightseeing tour you will be notified by email of your meeting spot. For our Kensington Market Sweet and Savoury Food Tour, we met at Ding Dong Pastries on Dundas Street. Ding Dong Pastries is actually in Chinatown, just across the street from Kensington Market. This busy Chinese bakery was an excellent bonus for us as the boys love both Chinese food and baked goods. What a combo! We entered the bakery and the scent of freshly baked pastries greeted us. We practically had to drag D to the back as he wanted to taste and buy everything in sight. A few members of the food tour were already seated. Tasty Tour food tours are limited to 10 people which make for a much more intimate tour. Among them was Audrey who would be our Foodie guide for the day. All Tasty Tour Toronto Food Tours are led by locals. Once all members of our tour group had arrived, we had fun series of introductions, a great way to get a group of strangers comfortable with each other. As part of the tour, we also learned historical facts about the area. For example, did you know that the original Chinatown in Toronto is now the site of Toronto’s current city hall, Nathan Philips Square? 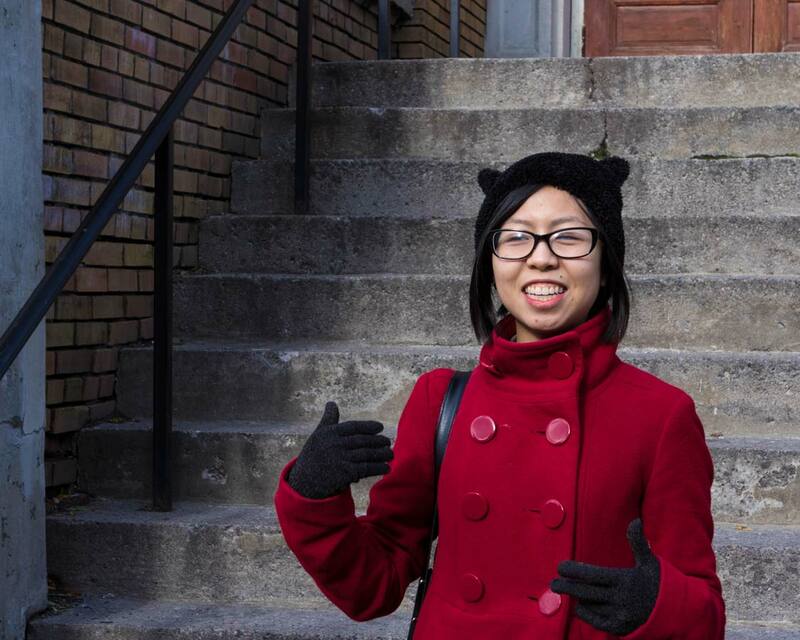 Besides the area around Spadina and Dundas, there is also another area in the city called East Chinatown which is on Gerrard Street East of Broadview Avenue. The boys could hardly concentrate though as in front of them sat a tray filled with one of their favourite foods, spring rolls! As soon as Audrey told us we could help ourselves to the food, the boys both grabbed a roll which they devoured quickly. The rolls were vegetarian and deep fried. The exterior was crunchy and not too greasy. It was very tasty and was a great start to our Toronto food tour. While eating Audrey told us a bit of history surrounding spring rolls. Also, we learned about how Ding Dong Pastries was a very popular spot for local university students due to the budget-friendly prices and great quality of the bakery’s food. The food stops in the Kensington Market Sweet and Savoury Tour only involve a few minutes walk. However, Audrey would stop us at key points of interest along the way to explain the history and unique facts about the buildings and businesses that we were wandering by. Before we knew it we were in front of Moo Frites our second destination. Moo Frites is known for their Belgian style frites and variety of sauce offerings. A quick glance at the picture outside of the restaurant and the boys both screamed poutine! A quintessential Canadian food, poutine is made up of fried potatoes, topped with cheese curds and covered in gravy. There is no surprise as to why Moo Frites is considered one of the best restaurants in Kensington Market. Audrey took the reins and ordered dishes for everyone. For the vegetarians in our group, it was possible to order the fries with spicy mayo instead. The poutine arrived in a paper cone cup that fit nicely into holes cut into the table tops. The unique mixture of chicken and beef mixed to a thick gravy was mouthwatering. And the unique cooking method ensures that even under all that sauce, the thick-cut fries remained crispy and delicious. The poutine was the largest food portion we received on the trip and both kids could not finish it. Kevin and I were more than happy to take it out of their hands and into our stomachs. 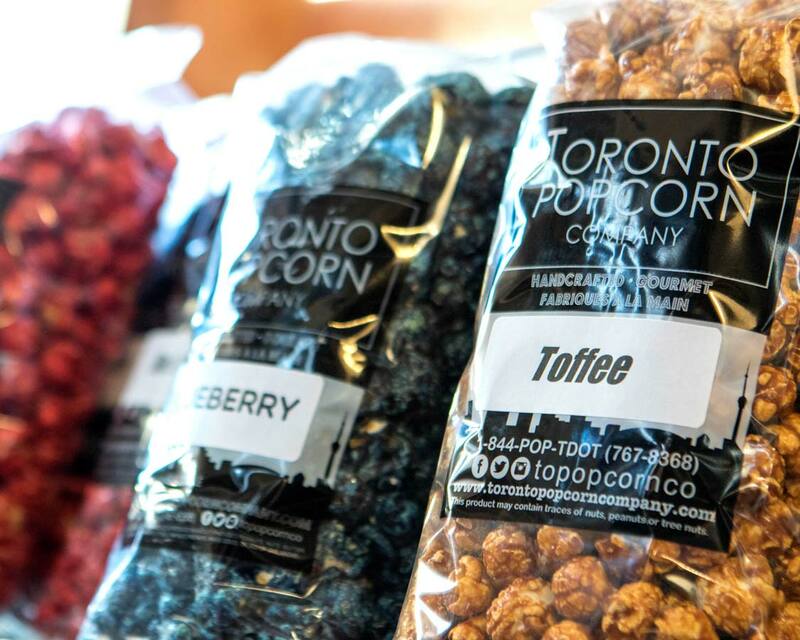 For a truly local taste of Toronto, we headed next to the Toronto Popcorn Company. 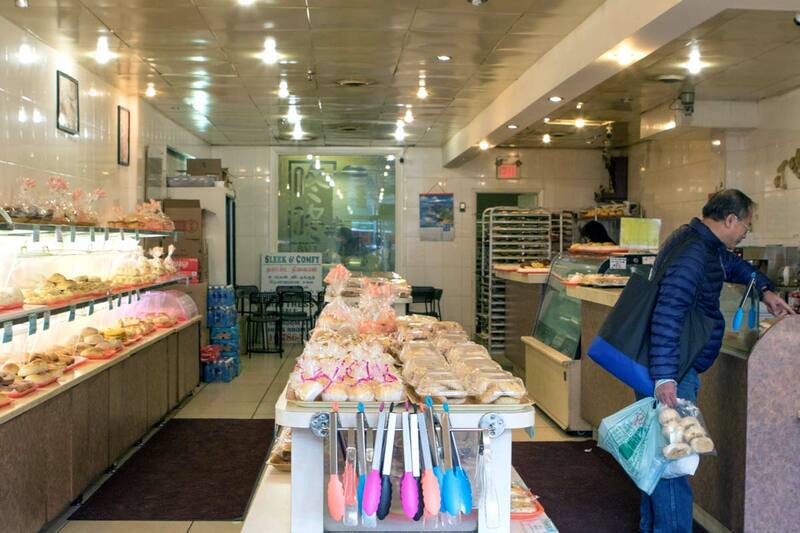 The store was started by a Filipino immigrant family in 2013. The popcorn is made fresh and there are over 100 unique flavours to choose from. And the kids were over the moon and tried to taste them all! 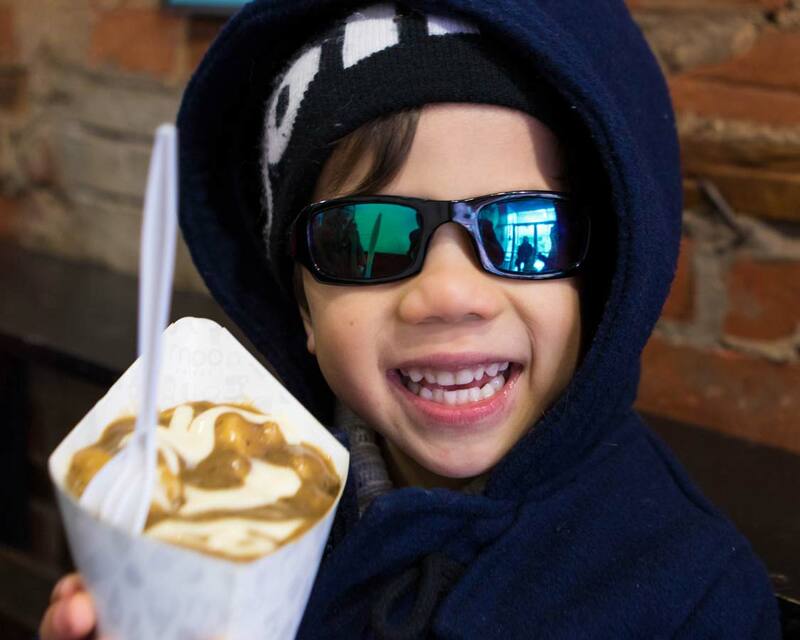 With flavours like maple bacon, blueberry, and pizza, the Toronto Popcorn Company was a hit for the whole family. Needless to say, this was definitely our boys’ favourite stop on the Tasty Tours food tour. Still wiping the crumbs and powder from the savoury popcorn from our mouths, we made our way to our next stop, Tibet Cafe and Bar. Initially, I thought we were going to have some freshly blended juices, but instead, we were treated to Tibetan dim sum called momos. 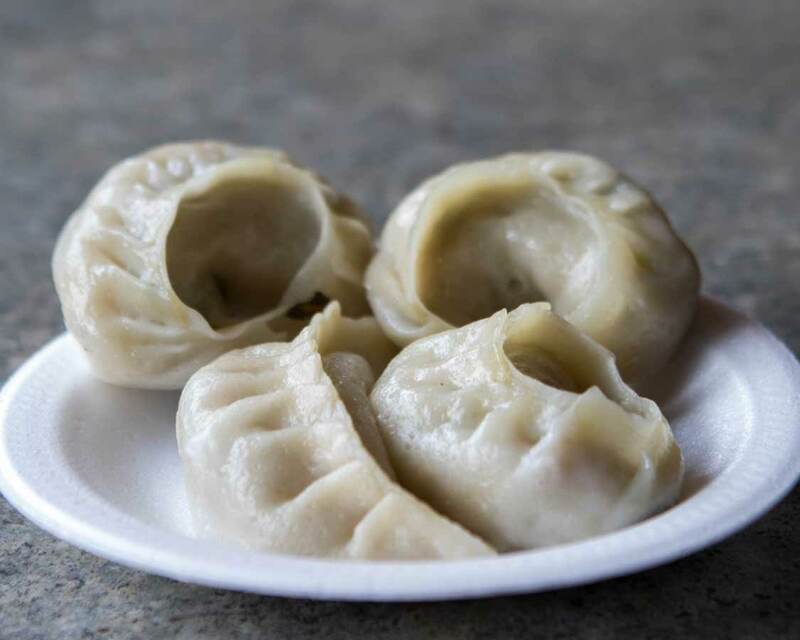 Momos can come either fried or boiled. During our tour, we tasted both the boiled beef momos and the vegetarian version. Momos are often served with a dipping sauce called acchar which can come in varying levels of spiciness. I tasted the momos both plain and with acchar and enjoyed it both ways. The momos by itself are quite flavourful so the sauce is not necessary. But if you like your momos spicy, then the sauce is a must. Interestingly, the Cafe has expanded to include offerings that are not Tibetan and is famous amongst locals for its version of Pad Thai. We didn’t have to go far to our next stop. Essence of Life Organics is just across the street from Tibet Cafe and Bar. 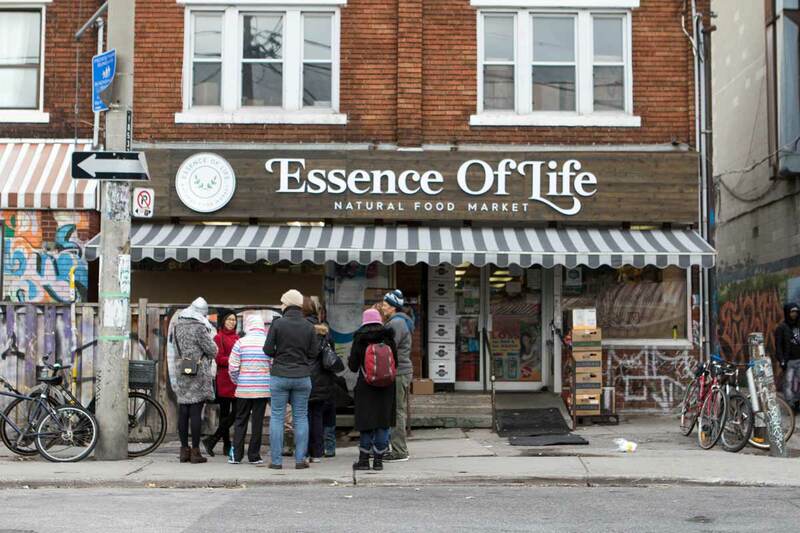 Essence of Life Organics is one of the longest-running grocery stores in Kensington Market, and the first all-organic grocery store in all of Toronto. In fact, it was also one of the first stores to embrace organics- back in the 1990’s when organics were not as mainstream. I was surprised when we stopped at a grocery store as it didn’t strike me as your typical stop on a culinary tour. But Audrey explained that we would be tasting another quintessential Canadian treat, maple syrup. Being that so many international travelers join Tasty Tours food tours, this made complete sense. For many visitors, this would be their first chance trying truly Canadian Maple syrup. Which as everyone should know, is the BEST maple syrup in the world! In between tastings, we learned how maple syrup is harvested and the difference between the various grades of maple syrup. Our family favourite was definitely the dark maple syrup. Panchos Bakery offers a taste of Mexico right in Kensington Market. 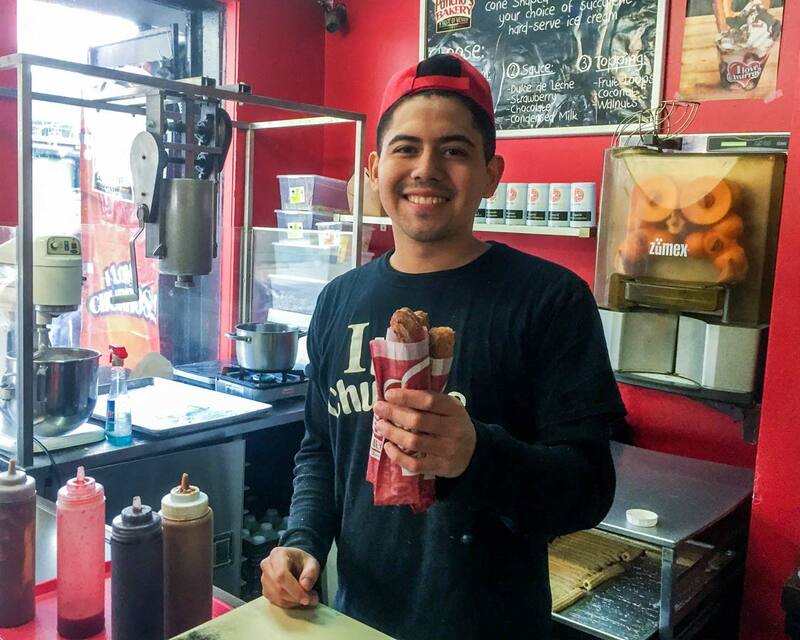 Their signature churros are made fresh and stuffed with your choice of vanilla, chocolate or caramel sauce. We opted for the chocolate stuffed version. With chocolate smeared all over their faces, the boys definitely got into their Pancho’s churros. The messy faces were a testament to the Pancho’s Bakery brand slogan “I love churros”. Pancho’s is located in a building called El Gordo, and it houses a series of Latin American restaurants. The unique mix of small, local restaurants gives visitors great options for unique eats in Kensington Market. Livelihood cafe is a unique coffee shop in Kensington Market. They have a mandate of hiring new immigrants and people with low skills. The Livelihood Project works to develop the skills of their employees so that they learn new skills and become more marketable for the job market. 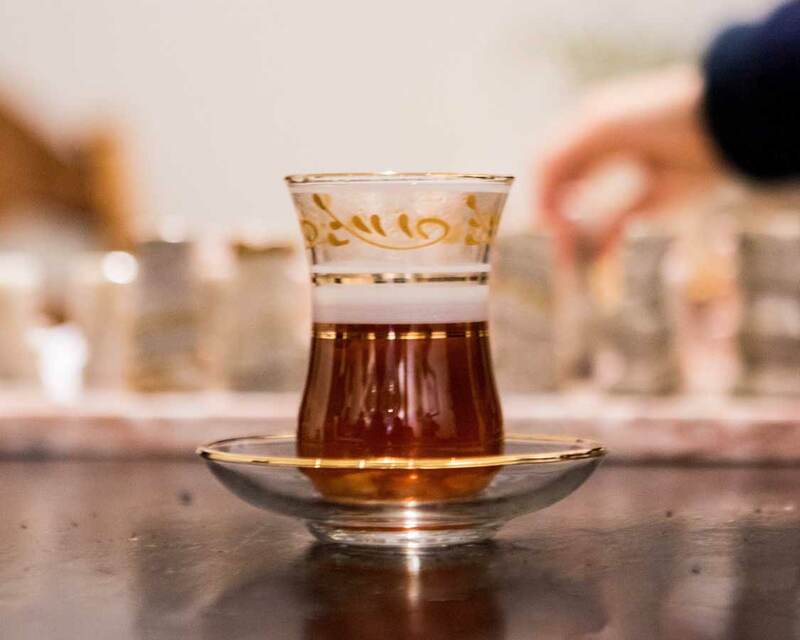 Here, we were treated to a delicious Syrian tea. First, we were introduced to tea-making process and how much time it takes to make this specific tea just-right. Next, the tea was paired with a delicious, made in-house hummus and vegetable over toast treat. And it was among the tastiest hummus dishes I have ever had. A Tasty Tours walking food tour offers a fantastic family-friendly combination of attractions. 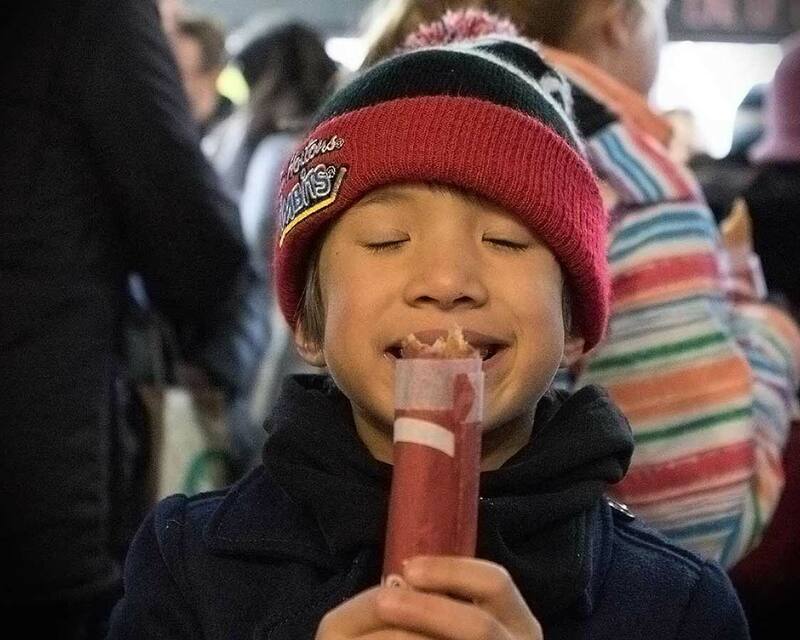 Everyone will love the tasty treats, while parents and older kids will learn cool facts about the history of Toronto’s Kensington Market. If you are looking for things to do in Toronto this weekend, consider joining a culinary adventure with Tasty Tours. And we would love to keep it all to ourselves, but we can’t leave out the Toffle! The Toffle is a custom-made chocolate treat available only to those who take a Tasty Tours food tour in Toronto. The Toffle is somewhere between a truffle and a butter tart (a quintessential Canadian pastry treat with a sugar and butter centre). And it’s scrumptious! It is easy to see why Kensington Market is considered one of the best places to visit in Toronto. It’s fascinating anti-corporate leanings and push for small, original businesses and restaurants make it unlike anywhere else in Toronto. When the tour ended, we began making our way back towards the subway for our trip home. But for those who want to continue to explore the area, you might want to consider wandering Chinatown along Spadina Ave. and Dundas St. Why not check out the unique Holy Trinity Russian Orthodox Church, or shop at some of the cool local businesses that line the pedestrian-friendly streets of Kensington Market. And if all that food isn’t enough for you, make the trip to Niagara-on-the-Lake and take a wine and food tour in another one of Ontario’s best foodie destinations! But for those looking at what to do in Toronto this weekend, or just looking into where to eat in Toronto, it’s definitely worth experiencing a Tasty Tours Toronto city tour experience in Kensington Market. Disclosure: We were guests of Tasty Tours Toronto on this excursion. But as always, all opinions remain our own. Wandering Wagars is a participant in the Amazon Services LLC Associates Program, an affiliate advertising program designed to provide a means for sites to earn advertising fees by advertising and linking to amazon.com, amazon.co.uk, amazon.ca. Amazon and the Amazon logo are trademarks of Amazon.com, Inc. or its affiliates. That sounds like a great way to discover a new area or city – and have lunch at the same time! I like the way your guide mixed historical and cultural stories into the tour which seems to fit with the cosmopolitan food menu. I’ve been to the Kensington market, but now I feel like I have to back to see these vendors. Did you try a peameal bacon sammie? I’m always up for a good food tour, and Toronto has so much food diversity to enjoy. That Toffle sounds totally delicious – who can resist a butter tart-like truffle?! Well, you won me with the chocolate ? tour in the beginning, but the one you did seems to satisfy both sweet and non-sweet teeth 🙂 I love the guiding foodie is a local person and all the spots you visited and tasted in Toronto seem a good choice! That looks like an amazing food tour. Ding Dong Pastries sound delicious and so do the fries! Were you stuffed by the end of it? My mouth is watering after reading this article! It is so interesting all the different ethnic foods you can try all in one city square. Kensington Market is going on my list of things to see in Toronto! How fun. Our family loves to eat too. We should try an official food tour in our own town, we have tons of great diverse neighborhoods and eats in Orange County. I love how different all of these places are. Now it’s time for us to look into family friendly food tours here in San Diego, or we can just book a trip to Toronto! This is perfect! We are going to Toronto in 2 months, I’m bookmarking this so I can put some of these on are to-do list. I haven’t had momos in years-I’m so excited! Is Tulum The Best Place for a Family Vacation in Mexico?